With up to 500 watts. mono subwoofer amplifier. 1x Mono subwoofer amplifier. 300 watts RMS x 1 at 4 ohms (500 watts x 1 at 2 ohms). RMS of power, you'll get clear, loud, and rockin' bass in your car. Trending at $114.00eBay determines this price through a machine learned model of the product's sale prices within the last 90 days. Compact Series Monoblock Class D Car / Marine Amplifier. 3-way protection circuitry (thermal, overload, and speaker short protection). CEA-2006 compliant amplifier. Conformal-coated circuit board — suitable for power sports and marine applications. Trending at $122.65eBay determines this price through a machine learned model of the product's sale prices within the last 90 days. 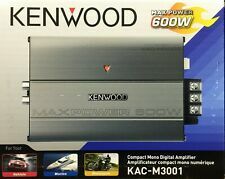 Kenwood - KAC 1000W Class D Digital Mono MOSFET Amplifier with Variable Low-Pass Crossover - Black/Dark silver. 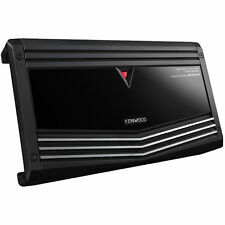 Upgrade your car audio system with this Kenwood power amplifier. 1000W total power. Class D circuitry. Used Kenwood KAC-8105D Class D Mono Power Amplifier . Condition is Used. Shipped with USPS Parcel Select Ground. Black and silver amplifier. Amp is pre owned and in fair condition with scratches, marks, and scuffs. Amp has been tested and works. Kenwood KAC-8104D Mono Car Amplifier. 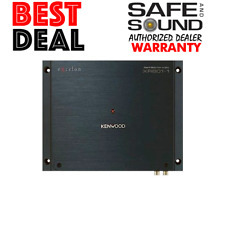 1 x usedKenwood KAC-8104D Mono Car Amplifier. Also I am including an allen wrench to remove the 2 screws on the top cover. The cover must be removed to attach your wires. 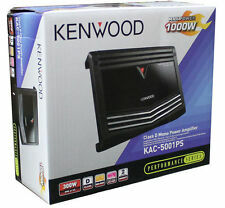 Kenwood KAC-9106D 2000 Watts Performance Series Monoblock Class D Car Amplifier. MONOBLOCK SUBWOOFER AMPLIFIER. When you power your subwoofer with Kenwood's Performance Series KAC-9106D amplifier, you'll hear all the great tonal color, impact, and detail in your music's bass, from the hard punch of the rhythm section to the soft thump of a quiet kick drum. This Amplifier features low-pass and subsonic filters that send the correct frequencies to your subwoofer so it will sound it's best and play efficiently. Mono Subwoofer Amplifier. Class D Amplifier design. Old School Kenwood KAC-727 Main Stereo Amplifier New In Box ! 500 Watts RMS x 1 at 4 Ohms. 1000 Watts RMS x 1 at 2 Ohms. Speaker Level Input with Signal Sensing Turn On. 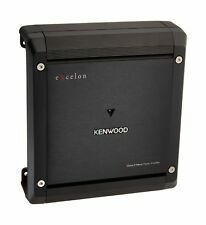 Kenwood Excelon X501-1 Class D Mono Amplifier Condition is New. Shipped with USPS Priority Mail. 300 watts rms at 4 ohms. 78 dBASignal to Noise Ratio (Reference: 1 Watt into 4 ohms). 600 W x 1(2Ω) (100 Hz, 1.0% THD). 400 W x 1(4Ω) (20 Hz - 200 Hz, 1.0% THD). 50 Hz - 200 Hz (variable)Low-Pass Filter Frequency. Max Power Output. When you power your subwoofer with Kenwood's Performance Series KAC-9106D amplifier, you'll hear all the great tonal color, impact, and detail in your music's bass, from the hard punch of the rhythm section to the soft thump of a quiet kick drum. Old School Amp 600 Watts 2 channels Mono ideal for base, Used perfect condition buyer responsible for shipping. 300 watts RMS x 1 at 4 ohms (500 watts RMS x 1 at 2 ohms). mono subwoofer amplifier. Class-D amplifier design. wiring and hardware not included with amplifier. bass boost (0-18 dB at 40 Hz). These amplifiers have a small footprint allowing installation in even the tightest of locations. For those who need a truly custom installation the top plate can be removed and replaced with a creation of your choice. KENWOOD KAC-X401M MONSTER MONO SUBWOOFER AMPLIFIER. This thing huge! mono output 300w, Max: 1200w. large secondary capacitors for more energy storage. requires 4-gauge power and ground leads — wiring and hardware not included with amplifier.